(Photo: REUTERS / David Moir)An engineer works on an M777 howitzer at the BAE Systems factory at Barrow-in- Furness, northern England April 12, 2011. The Global Combat Systems team has handed over the 777th M777 to be produced at the site. It will be delivered to the Minnesota National Guard. Photograph taken on April 12, 2011. 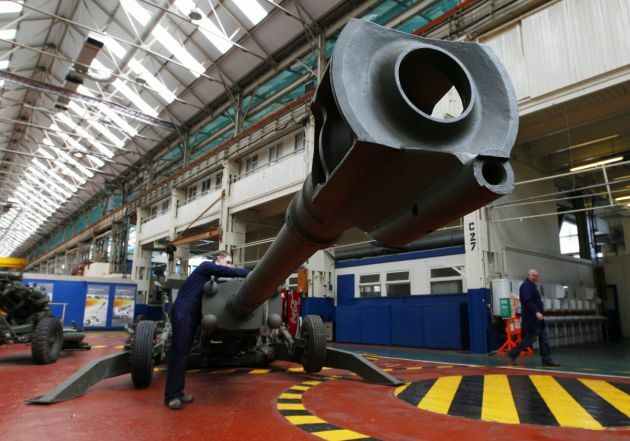 Almost 3,000 people have signed a letter to the Archbishop of Canterbury, Justin Welby, calling on him to cut Church of England ties with the armaments industry. The signatories include people of all denominations and many Anglican clergy, the Ekklesia think tank reports. Christians gathered outside Church House Conference Centre in London, the administrative headquarters of the Church of England on July 15 to urge it not to host a second event sponsored by weapons manufacturers. This follows the Land Warfare Conference, run by the military think tank RUSI (Royal United Services Institute) which took place in the same venue on June 30 – July 1. The Chief of the Air Staff's Airpower Conference was to run from July 15 to 16 and is sponsored by a number of arms companies and drone manufacturers, including BAE Systems which arms Saudi Arabia, and Lockheed Martin, the biggest armaments company in the world, said Ekklesia. Symon Hill, Christian writer and a coordinator of Christians for Economic Justice, said: "Jesus said that where our treasure is, there will our heart be also. "By hosting events sponsored by arms dealers, Church House Conference Centre is sending a clear message that they are happy to profit from those selling weapons to the dodgiest regimes." Campaigners are calling on Welby, as President of the Corporation of Church House, for his "assurance that the conference center will never again host events which support and legitimise the arms industry." Welby is the spiritual head of the Church of Anglican and the highest ranking bishop in the 80-million strong Anglican Communion. The Church of England holds its annual conference, the General Synod, in the same room as the arms-funded events. Church House Conference Centre has criticised the decision taken by St Paul's Cathedral not to host events with, or sponsored by, arms manufacturers. Emma Anthony, Membership and Outreach officer for the Fellowship of Reconciliation, said: "We have been trying to communicate with Church House Conference Centre for a number of years, but they've not engaged in constructive dialogue. "We have written to them about the sponsors, but they have ignored our simple questions. By taking it to the next level and writing to Justin Welby, we are showing that we won't we won't drop this until Church House Conference Centre drops the events and changes its policy." Rev. James Mercer, an Anglican priest in Harrow Weald near London, said: "With the Church of England rightly avoiding investment in companies involved in military products, it seems wholly inappropriate for Church House Conference Centre, despite its 'management separation' from the church, to host conferences sponsored by arms manufacturers, including Lockheed Martin and Finmeccanica." The protest is supported by Fellowship of Reconciliation, Pax Christi, Campaign Against Arms Trade Christian Network, The Drones Campaign Network and Christians for Economic Justice.